(06)-156 Wayne Chrebet. Cards average NrMint condition - Included players listed below (03)-090 Curtis Martin. - We always provide exact players & card numbers to eliminate any doubt. (17)-387 Chad Pennington (Rookie). (04)-087 Wayne Chrebet. Contains all base cards from team listed as well as Rookie Short Prints (sp's). Cards average NrMint condition - Included players listed below (03)-054 Curtis Martin. - We always provide exact players & card numbers to eliminate any doubt. (01)-038 Wayne Chrebet. 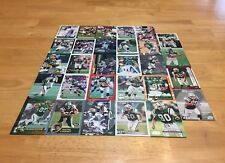 1998 Fleer Brilliants NEW YORK JETS Football Team Set. These contain all base & rookie cards for the team listed (1-150). Cards average NrMint condition - Included players listed below. (03)-099 Wayne Chrebet. 2000 Donruss NEW YORK JETS Football Team Set. Contains all base cards (1-150) No Rookie SP's. Cards average NrMint condition - Included players listed below (01)-097 Curtis Martin. The cards would make a great addition to anyFootball card collection! WE ADD NEW INVENTORY DAILY !